A Baltimore City police officer was recently charged with assault after being involved in an altercation in Harford County, Maryland. The exact facts surrounding the altercation are in dispute, but the Baltimore police officer certainly has an interesting explanation for how he became involved in the assault. The criminal charging document alleges that the 10 year Baltimore police veteran, who was off duty at the time, approached a parked vehicle with two occupants seated inside. The police officer was apparently yelling at the occupants to stop dealing drugs, and approached the car in a threatening manner despite not seeing any actual drug transaction taking place. The charging document goes on to say that the off duty Baltimore cop pulled one of the occupants, a Bel Air, Maryland man, out of the car and committed the assault by slamming him to the ground. The Baltimore officer, who has not hired a criminal lawyer as of yet, then furthered the assault by allegedly pulling out his police semi automatic Glock 22 and pointing the gun in the face of the victim. While the Baltimore officer had his police issued pistol pointed at the victim, he was allegedly still yelling about the drug transaction that may or may not have occurred. There were witnesses to the entire incident, and one witness apparently called the Harford County police, which arrived on scene in minutes. When the responding Harford County police officer arrived, he observed the off duty Baltimore officer standing over the injured victim with another unidentified man. All parties were questioned on the scene, but nobody was arrested. The victim claimed that there was never any drug deal, but rather that he was in the car to collect money that was previously owed to him by the other occupant of the car. The victim maintained that he did not at any time buy, sell, or possess any drugs, and further claimed that the off duty Baltimore cop had aggravated a prior injury that he sustained during a serious car accident. The Baltimore officer presented an entirely different story to the police on the scene, stating that he observed what he thought was a drug transaction, and attempted to break up the transaction. Upon approaching the car to end the drug transaction, the Baltimore cop stated that the victim tried to flee the scene but was then lawfully detained. 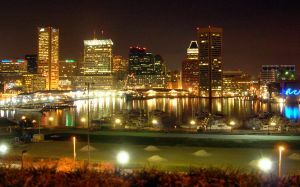 The Baltimore officer stated that he did not threated the victim in any manner with his firearm. The responding officer did not find any drugs on the person of the victim or in the vehicle, but an empty box of cigarettes with marijuana inside was found near where the car was originally parked. Rather than make an arrest at the scene of this Maryland assault, the responding officer elected to gather all the information from the parties involved. After reviewing all the reports, the Harford County sheriff decided to pursue charges against the off duty Baltimore cop, who was subsequently issued a summons for second degree misdemeanor assault. The second man who was standing over the victim when police arrived was not charged with any sort of crime because there was no evidence that he threatened the victim in any manner. The Baltimore officer, who has been suspended with pay, must appear at the end of August in Bel Air district court to face this criminal assault charge. Benjamin Herbst is a Maryland criminal lawyer who specializes in assault and drug possession cases throughout Maryland. If you or someone you know has been charged with possession or sale of marijuana or with with assault contact a criminal lawyer in Maryland for a free consultation.